Human rights are inherent to all human beings. They are defined and established in more than 80 international legal instruments1 and define the fundamental protections of human dignity, needs, and freedoms, such as food, housing, privacy, personal security, and democratic participation. Since the adoption of the Universal Declaration of Human Rights (UDHR) in 1948, the responsibility to protect human rights has primarily fallen on governments. Beginning in the early 2000s, however, it became increasingly clear that the freedoms enshrined in the framework could also be violated—and promoted—by the private sector. In 2011, the UN Human Rights Council unanimously endorsed the UN Guiding Principles on Business and Human Rights, the first international instrument to assign companies the responsibility to respect human rights. In 2011, the UN Human Rights Council unanimously endorsed the UN Guiding Principles on Business and Human Rights (Guiding Principles), the first international instrument to assign companies the responsibility to respect human rights. The Guiding Principles state that governments must put in place good policies, laws, and enforcement measures to prevent companies from violating rights; that companies must refrain from negatively impacting rights even when governments are failing to create or enforce necessary laws; and that victims of corporate abuses must have access to effective remedy. As part of this responsibility, the Guiding Principles require companies to undertake due diligence to identify and manage their negative human rights impacts. 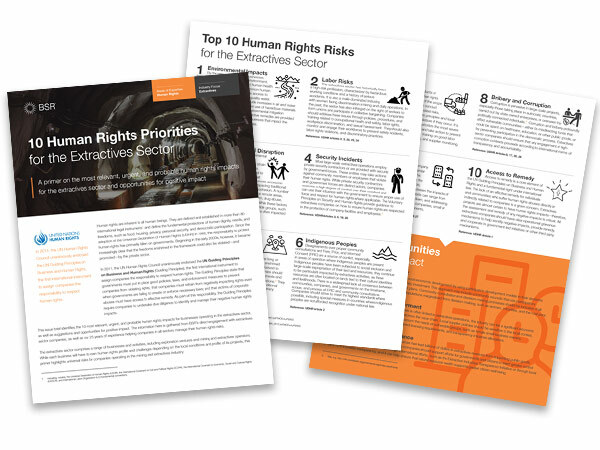 This issue brief identifies the 10 most relevant, urgent, and probable human rights impacts for businesses operating in the extractives sector, as well as suggestions and opportunities for positive impact. The information here is gathered from BSR's direct engagement with extractives sector companies, as well as our 25 years of experience helping companies in all sectors manage their human rights risks. The extractives sector comprises a range of businesses and activities, including exploration ventures and mining and extractives operators. While each business will have its own human rights profile and challenges depending on the local conditions and profile of its projects, this primer highlights universal risks for companies operating in the mining and extractives industry. By the very nature of their businesses, extractives companies impact the environment. These impacts can profoundly affect human health and well-being. One of the most common human rights issues in this industry concerns access to water and the health impacts of low-quality water. Additional environmental impacts include increases in air and noise pollution, increased road traffic, and the use of hazardous materials in mining. Companies must ensure environmental mitigation measures are put in place and that effective remedies are provided to remediate any environmental consequences that impact the human rights of workers and communities. The extractives sector has historically been a high-risk profession, characterized by hazardous working conditions and a history of serious accidents. It is also a male-dominated industry, with women facing discrimination in hiring and daily operations. In the past, the sector has also infringed on the right of workers to form unions and participate in collective bargaining. Companies should address these issues through policies, procedures, and training related to occupational health and safety, labor rights, workplace discrimination, and sexual harassment. They should also monitor and engage their workforces to prevent safety incidents, labor rights violations, and discriminatory practices. Extractives operations can have detrimental impacts on the communities where they are underway. The influx of outside workers may strain transportation, education, and health systems. New workers and increased incomes may lead to price increases in housing and basic goods that leave local populations without access. Furthermore, economic transformation may change social dynamics, impacting traditional beliefs, increasing inequality, and diluting social cohesion. A number of extractives sites around the world, especially in remote areas, have been associated with increases in alcoholism, drug abuse, prostitution, gambling, and domestic violence.2 While these factors affect many aspects of local communities, vulnerable groups such as women, the poor, minorities, and the elderly, are often impacted first and most severely. Unfair or insufficiently negotiated land acquisition, displacement of communities, and changes in land use and access to land for farming, grazing, cultural heritage, or forest resources can result in human rights violations and lead to conflict in the long or short term. In many cases, traditional land rights are not enshrined in law, and resettlements and acquisitions are, or are perceived to be, undertaken without adequate compensation. Companies should consider project designs that avoid unnecessary displacements and engage in culturally sensitive land and resettlement negotiations.4 They should also consider support for former land-owners or traditional occupants beyond monetary payment, such as financial literacy training. Disagreements over proper community consultations and Free, Prior, and Informed Consent (FPIC) are a source of conflict, especially in areas of operation where indigenous peoples are present. Indigenous peoples have been subjected to social exclusion and large-scale expropriation of their land and resources; they continue to be particularly impacted by extractives activities, as these resources are often located on lands tied to their cultural identities and livelihoods. There is a widespread lack of consensus between communities, companies, and governments on the timeframe, scope, and process of FPIC and community consultations. Companies should strive to meet the highest standards where possible, including special measures in countries where indigenous peoples are not afforded recognition under national law. Any business that procures products or services is at risk of contributing to human rights abuses in its supply chain. Regardless of the scope of company procurement, it is crucial to conduct supply chain mapping to identify the greatest risks, investigate compliance with human rights principles and local laws, and, where possible, remediate violations if they occur. It is important for companies to identify and prioritize the most severe potential violations in their supply chains and take action to prevent them. These actions can include supplier training on good labor practices, clear expectations in contracts, and supplier monitoring. Corruption is pervasive in large-scale projects, especially those taking place in autocratic countries, carried out by state-owned enterprises, or overseen by politically connected individuals.5 Corruption and bribery profoundly affect vulnerable communities—either by misdirecting funds that could be spent on healthcare, education, or other public goods, or by preventing participation in the democratic process. Extractives sector companies should ensure that any engagement in high-corruption contexts proceeds according to international norms of transparency and accountability. While the impact of an individual company may be modest, the impact of dozens of similar companies operating in the same geographic area can be severe. Not all companies take the same duty of care in addressing their impacts, and not every community can distinguish between the impacts of one company versus many. Cumulative impacts can range from environmental devastation to societal breakdown, and addressing them requires close collaboration with other companies, small or informal suppliers, communities, and governments. Access to remedy is a core element of the UN Guiding Principles on Business and Human Rights and a fundamental right under international law. The lack of an effective remedy for individuals and communities who suffer human rights abuses directly or indirectly related to companies is a grave concern. Extractives projects are almost certain to have human rights impacts—therefore, the assessment and remedy of any negative impacts is critical. All extractives companies should have clear operational grievance mechanisms to help identify negative impacts, provide remedy, and cooperate in government-led initiatives or other third-party mechanisms. Extractives companies can ensure inclusive socioeconomic development by using participatory development models in their decisions about resettlement, compensation, and community investment. This approach may include community councils that use participatory methodologies to produce inclusive development plans. Community consultation and decision-making processes should be inclusive of all groups and make special allowances for those populations marginalized from decision-making, such as women, minorities, and the rural poor. While direct employment for local communities is often limited in extractives operations, the industry can be a significant economic multiplier through direct and indirect employment across the value chain. Local supplier policies should be sensitive to the local context, investing in local talent pipelines and taking into account the needs of vulnerable groups, such as female small-business owners. Initiatives could include training programs, streamlined licensing requirements, and transparency in license allocations. Historically, poor management of natural resources has kept billions of dollars in extractives revenues from supporting public goods such as health, education, and housing. Extractives companies should support efforts for governments and citizens to exert greater control over natural resources. This can be done through international efforts, such as the Extractive Industries Transparency Initiative, or through local programs to increase transparency, and it can help ensure that natural resource wealth supports greater citizen well-being. We draw on a global network of partners from business and civil society to tackle human rights challenges and help companies in all sectors meet and exceed global human rights standards. These companies are at the nexus of the climate change debate, and many also have developed advanced thinking on sustainable communities, transparency, ethics, and social inclusion. Contact the Human Rights team with any questions. EITI is a global standard to promote the open and accountable management of oil, gas, and mineral resources. ICMM is an international organization dedicated to a safe, fair, and sustainable mining industry. The VPs are a set of principles designed to guide companies in maintaining the safety and security of their operations within an operating framework that encourages respect for human rights. Including, notably, the (Universal Declaration of Human Rights (UDHR), the International Covenant on Civil and Political Rights (ICCPR), the International Covenant on Economic, Social and Cultural Rights (ICESCR), and International Labor Organisation (ILO) fundamental conventions. Voluntary Principles on Business and Human Rights. IFC, Performance Standard 5; Land Acquisition and Involuntary Resettlement.